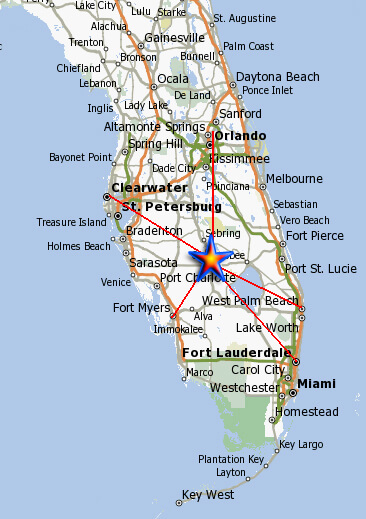 Covered Bridge is ideally located in Lake Placid, Florida and less than 15 miles North is Sebring. Our current model address is: 10460 High Grove Ave., Lake Placid, FL 33852. Go North on US-27 to Lake Francis Road. Go west on Lake Francis Road. Follow Lake Francis Road until you reach the Covered Bridge Development.You are now on Venetian Pkwy. Stay on Venetian Pkwy to Hillcrest Street and turn Right; Hillcrest to High Grove and turn Left. Go South on US-27 to Lake Francis Road (North of Lake Placid). Go west on Lake Francis Road. Follow Lake Francis Road until you reach the Covered Bridge Development. You are now on Venetian Pkwy. Stay on Venetian Pkwy to Hillcrest Street and turn Right; Hillcrest to High Grove and turn Left. Disney World is just a little over an hour away. And the major cities of Tampa, Ft. Lauderdale, West Palm Beach and Ft. Myers are under 2 hours. Copyright © 2018 CoveredBridgeLakePlacid | All rights reserved.